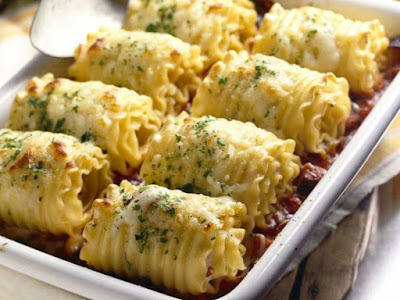 The popular Chicken and Cheese Lasagna Rollups from ivillage. I decided to give them a whirl a couple weeks ago (I have a backlog of stuff to post about, this being one, but just haven't had the chance to get to the office computer to type them up!). Adding the filling and rolling them up. ﻿ The Verdict: They were pretty good. A little too bland though, next time I would add some seasoning/spices to the cheese mixture. Joe would prefer it made with ground beef instead of chicken, so maybe next time I will try that and let you know how it comes out. The left overs also stored well and made a tasty lunch the next day! Things to Consider: Once again I used my old standby, the rotisserie chicken. It saved me the step of cooking up some chicken breasts. Also, I was a little too skimpy on the filling in the first couple of rolls, so I got a couple extra out of the batch.